I got the idea for these from Brendan Brazier's Fuel Bites, he says that dates and coconut oil both provide readily available energy to fuel performance. 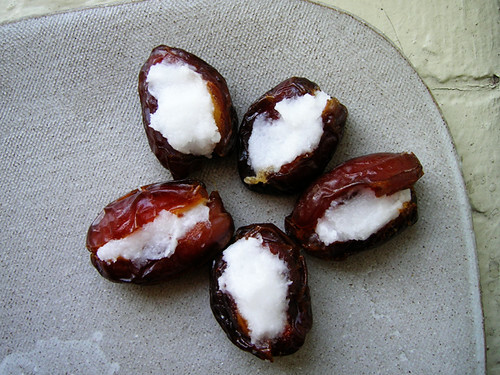 I am never going to put dates and coconut oil into a food processor and shape them into little bites, though. Dates are already shaped like little bites! What I'm going to do is yank the pits out of the dates, then stuff half a spoonful of coconut oil in the date. Whoop, I just gave away the whole recipe. I should also mention that these are so delicious, you get the sweetness of the date and the ...meltyness of the coconut oil, which tastes like super smooth Mounds filling. I wrap a few of these in plastic to eat just before playing for a little extra energy boost.